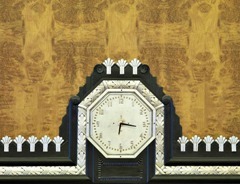 Art Deco Classical is a term I coined to describe the coming together of the Art Deco and Classical styles. While Art Deco can be radically different from its predecessors there is a considerable amount of Art Deco Architecture that is simply the traditional classical look updated with a modern edge (circa 1930’s). This is often the case with Government buildings, where architects, or their clients, kept the focus on traditional themes and motifs. Take as an example the Ohio Supreme Court building. This was built in 1931 to house various government departments. 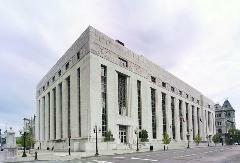 It was renovated in 2004 and converted to duty as the home for the Supreme Court and related judicial programs. With minor changes to its exterior it could be a typical Classical courthouse. It has pillasters with capitols. 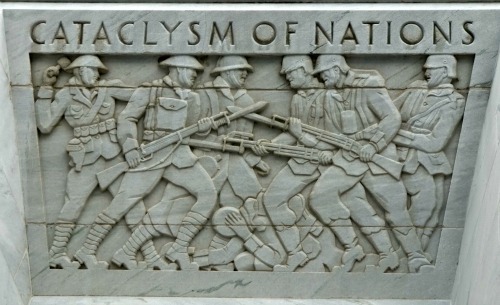 It has bas-relief sculptures that look fairly traditional. Its first few floors remind me of a mausoleum, but from there it grows into an office building, topped with a row of columns on the upper floor.. Yet it was created by architects who had caught a whiff of Art Deco and found a way to interweave its look into a traditional structure. The top of the square columns may have ended in capitals, but there is a stylized look to them. These are not your standard Corinthian columns, covered in Acanthus leaves. Instead we find a geometric representation of wheat. Many of the bas-relief carvings have sun rays forming the background for the main figure. Rays radiating out from a central point was a common Art Deco device. The lamps on the side and the front are decidedly Art Deco and modern. 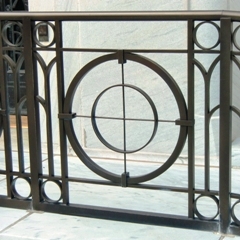 The balusters on the railings are a simple, repeating, geometric pattern. These are items for which there are not strong classical precedents, so the architects had a freer hand. 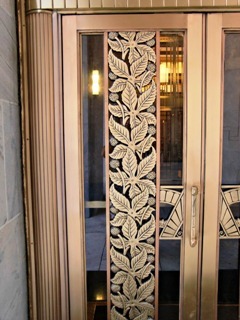 Conversely the grills on the entry doors have a repeating Buckeye leaf pattern that is not strongly Art Deco. If you had designed the leaves absent of any desire to create an Art Deco building the pattern would not look all that different. The leaves are little flatter, a little more two-dimensional, but if I had come across these in another context I would not have said “Art Deco”. The one part of the grill that is strongly Art Deco is the geometric pattern on the part of the grill that connects to the door fram near the handle. 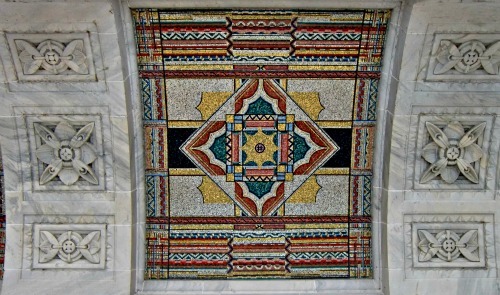 The ceiling of the loggia contains geometric mosaics. 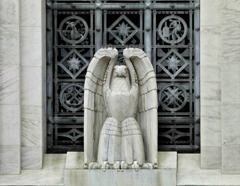 Some of the carvings near the main entrance are highly stylized and would fit into any Art Deco gallery. Some of the pillasters adjoin openings in the wall and have an interior face showing on the inside of the opening. These pillasters are smooth on the side facing out, but have a reverse fluting on the side facing the opening. 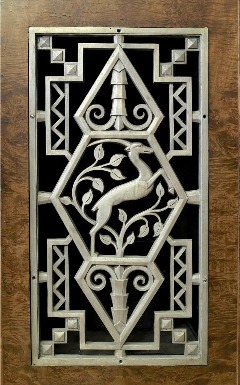 This give a unique, modern look to what is otherwise a traditional structural element, but it is a very subdued hint at the Art Deco. From the street this is a point that is likely to be missed. Yet there are also many carvings that are very naturalistic. 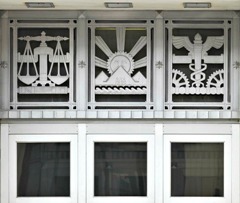 The buckeye leaf, a symbol for the state, is repeated throughout the carvings on the building, but the leaf carvings are realistic. It would have been easy to have used the strong, natural geometry of the leaf as a springboard to creating a representational (i.e. - Art Deco) version of the leaf. Many of the carvings represent historical events or people. 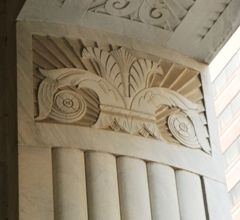 These are naturalistic, and could have fit on any other Classically-inspired courthouse in the country. The interior, like the exterior, is a mix of classical and Art Deco. Many decorative elements are Art Deco, but there are a considerable number of murals that are not. 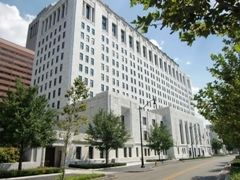 Until I complete the interior section, let me summarize by saying that the Ohio Supreme Court building is a mixed bag. Some things are pure Art Deco, some are pure Classic, and in a few areas they were able to deftly mix the two influences. 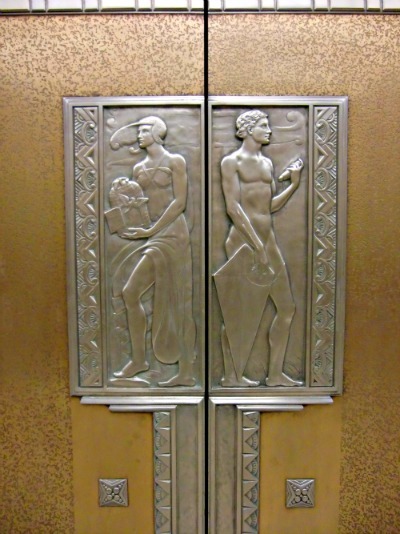 The first floor elevator doors are all decorated with bronze bas-relief plaques by Paul Fjelde. Four show the four seasons and four show the the four elements of anitquity: Earth, Wind, Water and Fire. This door shows wind. I am not sure who flies kites when they are naked, but the sculpture is wonderful. 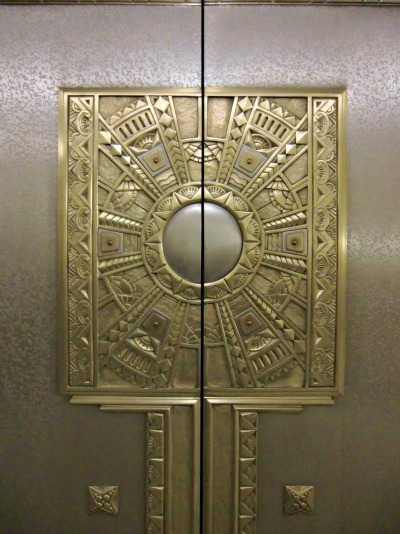 If the figures are not obviously Art Deco the decorative trim gives it away. The ground floor elevator doors all bear the same plaque. 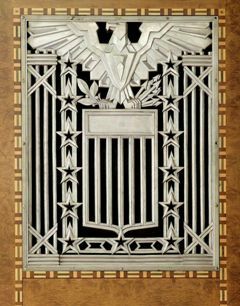 This bas relief is Art Deco all the way through. 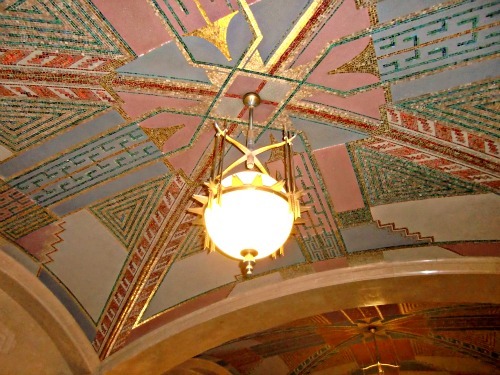 The ground floor has Indian-inspired mosaics on the vault ceilings. 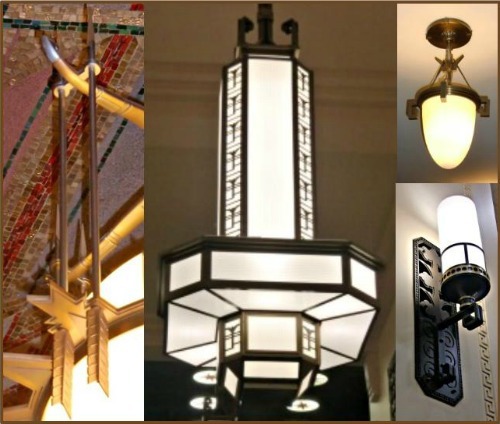 The globe lamps that hang from the center have an Art Deco sun ray theme, but the rays are suspended from above by four sets of two brass arrows. The mosaic and lamp are pictured above. The detail of the arrows are better shown in the lamp collage below. The Library of Congress has a fine collection of photographs, many taken by photographers on government assignment. 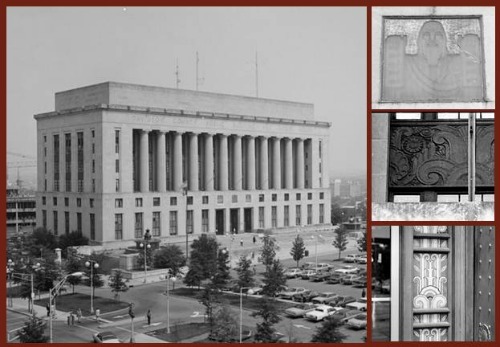 The 1930’s was a time when the government invested a lot of money into public works including government buildings. Many of these were Art Deco interpretations of classical buildings. I have included several pictures below for your education and enjoyment. 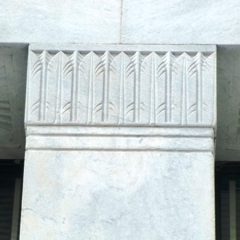 Although it looks a lot like the Lincoln Memorial, the details on the Davidson County Courthouse (Nashville) are Art Deco. The top right photo is a carving in glass of Moses. The middle right photo is our old friends the volutes in a sort of randomized Art Deco collage, and the lower right photo shows them doing double duty as trim around the doorway. The James T. Foley United States Post Office and Courthouse in Albany, New York is an excellent example of a successful application of Art Deco to a Classical style building where the Art Deco dominates the Classical. If you take a close look at the building the strong classical shape lacks any traditional columns or pilasters. The shape looks right, but most of those things that define a building as a Classical building are lacking. With the slight stepping in at the windows it is as if the architect is suggesting that presence of columns. The windows in the frieze are suggestive of the metopes and triglyphs that should go there. This type of suggesting of a classical building without actually delivering is usually not successful, but here I think the architects hit a home run. The details are Art Deco and, at least from the pictures, make this an excellent example of what I call Art Deco Classical.